Christen Johnson is a third-year medical student at the Boonshoft School of Medicine and president-elect of the Student National Medical Association. When she was 3 years old, Christen Johnson’s mother took her to the doctor at an urgent care facility for an ear infection. Because Johnson was the last patient of the night, the physician took extra time with her. She let Johnson listen to her heart and explained all of the medical equipment in the room. After the visit, Johnson fastened herself into her car seat and said she wanted to be just like the “lady doctor” when she grew up. 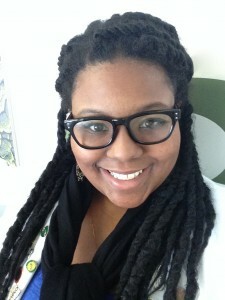 As president-elect of the Student National Medical Association (SNMA), the oldest and largest medical student organization dedicated to serving the needs of underrepresented minority students who wish to pursue careers in the field of medicine, Johnson has spent much of the year promoting mental health awareness and leadership development. She also serves as chair of the national SNMA elections committee. Johnson first became involved in SNMA as an undergraduate student at Wright State, where she earned a Bachelor of Arts in Biological Sciences with a certificate in African American and Women’s Gender Studies. Johnson was a member of the Minority Association of Premedical Students (MAPS), which represents the undergraduate and post-baccalaureate students of SNMA. She became involved in a mentoring program with the SNMA Wright State chapter. The MAPS group attended SNMA chapter meetings and events. Once she became a medical student at the Boonshoft School of Medicine, she served as a Region V assistant regional director and president of the Wright State chapter, in addition to other positions within the local chapter and regional and national organizations. Johnson describes SNMA as an organization that enabled her to grow and develop professionally and personally. Johnson will serve as president-elect of SNMA until March when she becomes president at the SNMA Annual Medical Education Conference in Austin, Texas. In the meantime, she is busy as a medical student at Wright State, where she is active in the Family Medicine Interest Group, of which she is the past copresident. She also is a member of Phi Rho Sigma, a national social and community service organization represented by Alpha Upsilon Chapter at the Boonshoft School of Medicine. Johnson, who will graduate from medical school in May 2017, also is a member of the Latino Medical Student Association Artemis Medical Society and the American Medical Student Association. She is a 2015 recipient of a scholarship from the National Health Service Corps (NHSC) Scholarship Program, which awards scholarships to students pursuing primary health care professions in return for a commitment to provide health care to communities in need. After a residency in family medicine, she plans to serve at an NHSC-approved site in a high-need health professional shortage area for a minimum of two years. Her goal is to become an academic family physician with a special interest in adolescent health. She wants to dedicate her career to the elimination of health disparities.